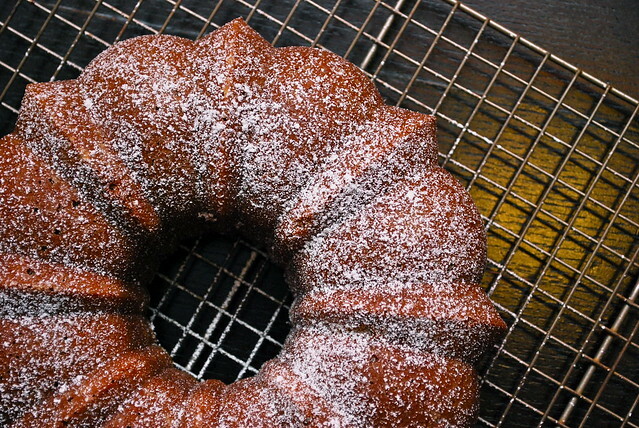 There is a certain kind of magic that seems unique to the Bundt cake. 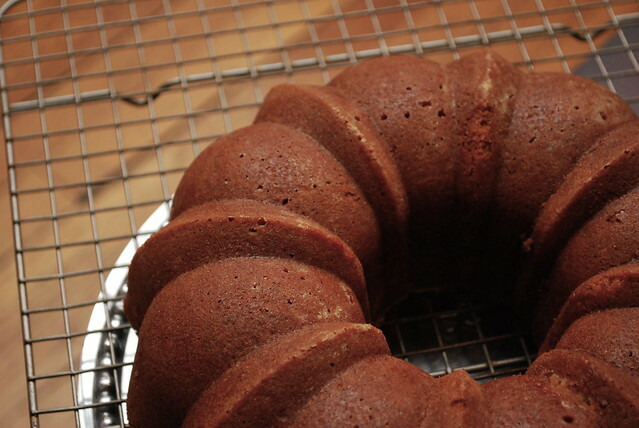 As frequently as I bake, I admit that I still gasp a little bit each time I pull up an inverted Bundt pan to reveal a perfectly--and beautifully--formed cake below. In fact, there are few other cakes that inspire me more. For the past couple months, I've been recovering from a back injury (a "bulging disc") that has made going about my day a little bit more difficult that usual. The simplest movements--leaning over to brush my teeth, opening the oven, even putting on my shoes--have become an exercise in creativity and (at times) contortionism. The first couple weeks after my "episode" I was in much too much pain to really do any serious cooking, let alone baking. Dinner became a bit of a slapped-together affair featuring a variety of sandwiches and salads and the occasional delivery from the nearby Italian restaurant that does dinner well, but dessert not so much. After a couple weeks of this, I'd had enough. I missed baking! I missed creaming together softened butter and sugar until it reaches that light and fluffy point. I missed sifting together a cloud of flour and baking powder and salt. I missed the familiar flow of running a spatula gently through the batter to combine the dry and wet ingredients. Most of all, I missed that moment, just a few minutes before the timer rings, when the scent of freshly baked cake seems to suddenly fill every nook in my home alerting anyone who is paying attention that it. is. ready. I was still in quite a bit of pain, but I couldn't resist, and so one Monday afternoon, Eugene came home from the gym to find me cracking eggs in the kitchen. "What's going on here? Are you baking again?" "I'm trying," I replied, moderating my response so as to not get his hopes up. I knew I needed to make something simple--I just didn't have the energy for a layered affair requiring more than one bowl, but I also needed it to be just a little bit exciting. I wanted a cake that was worth the effort. I was inspired by a bag of walnut meal that I'd been storing in my freezer. I paired it with my favorite whole wheat pastry flour, and used a pinch of saffron threads to infuse the milk (a trick I'd used with much success last year in this saffron almond cake). The end result was lovely--fragrant with the aroma of walnuts and saffron. I served it plain with just a light dusting of powdered sugar. We had a couple slices that night, then I brought the rest of the cake in to work the next day where it all but disappeared as my co-workers wandered by every so often to slice off another piece. With its luxurious flavors and regal appearance, this cake was just the thing to pull me back into the kitchen. 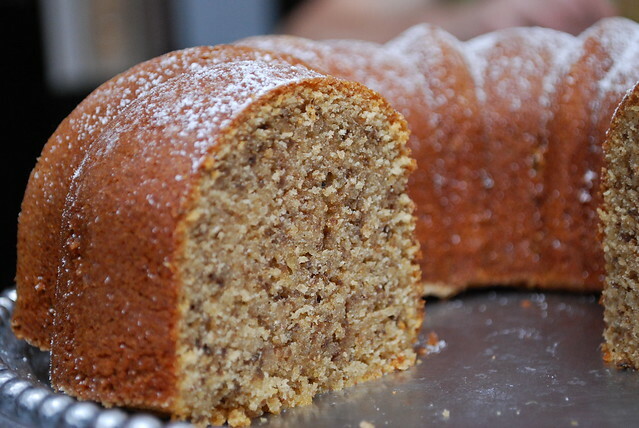 It's a simple cake, definitely, but it's anything but plain. New to Always Order Dessert? Consider subscribing to my RSS feed, follow me on Twitter, become a fan on Facebook, or sign up to receive my once-a-week e-mail updates by filling in your address in the box on the right. Thanks for reading! Preheat your oven to 350 degrees and generously butter (no need to flour) your Bundt pan. You can also use a baking spray to coat (I’m a little obsessed with that Pam for baking spray). 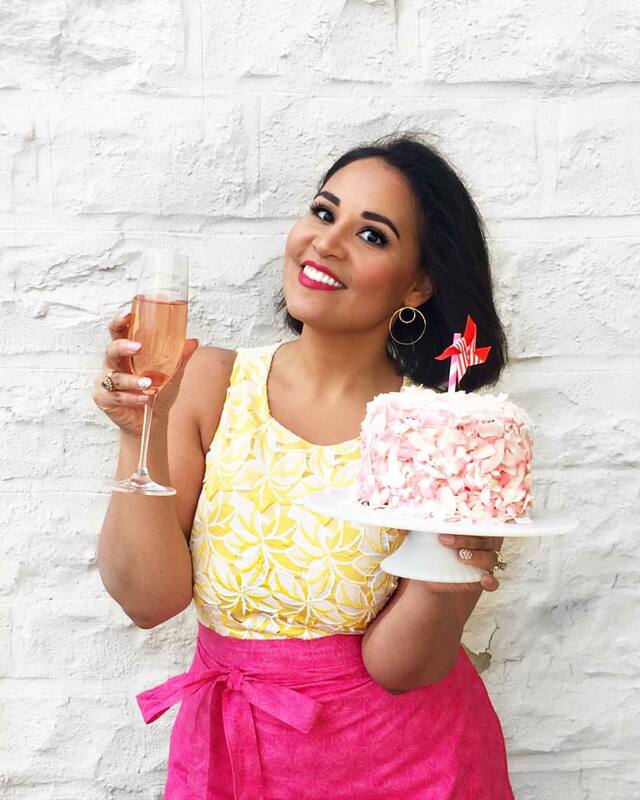 Combine the butter and both sugars in the base of your electric mixer and beat together for about 5 minutes or until the butter is light and fluffy, add the eggs in, beating for about a minute after each one, then add the almond and vanilla extracts and mix until combined. Place the milk into a small saucer and heat over medium heat just until bubbles start to form around the edges and the milk is heated through (you can also do this in the microwave). Stir in the saffron threads and let cool to room temperature. The saffron will infuse the milk with a rich aroma and will turn it a bright sunshine-y shade of yellow. While the milk cools, combine the whole wheat pastry flour, ground almonds, salt, and baking powder together in a separate bowl mix until evenly distributed. Alternating with the saffron milk (leave in the threads), gently stir the flour and walnut mixture into the egg and sugar mix, until it has all been added. Stir just until completely combined. Pour the batter into the prepared Bundt pan, and smooth out the top. Bake on the middle rack for about 60-70 minutes, or until a tester inserted into the cake comes out clean. Let cool in the pan for 10-15 minutes before inverting onto a rack and letting cool completely. Serve plain or with a light dusting of powdered sugar. Keeps at room temperature under a cake dome for about 1 week.